Back to School Secondary Science Huge Giveaway!! As much as I hate to admit, the end of summer vacation is getting close, and we have start thinking about school starting up! Luckily for you, the secondary science teachers of Teachers Pay Teachers are here to try to make your life easier as you head back to school! 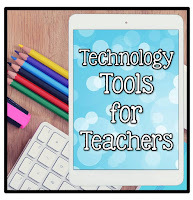 This is a great chance to buy some new digital resources, if you have new technology this year. If you have a new prep, you might want curriculum guides, or even a big package where you will get all the products in my store related to either Earth Science or Biology. 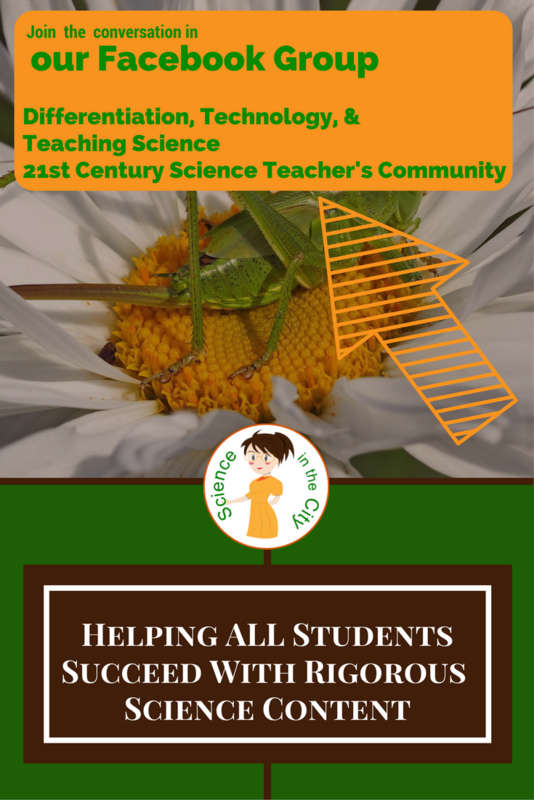 If you are teaching Biology you might be interested in this growing bundle. It gives you a full year of biology warm ups, in both full screen/digital task card AND google forms format! As it is still a growing bundle, so you get it at a discount now as it is still growing. Lastly, if you are looking for some tools to help you organize your classroom and simplify things as we head back to school, you might be interested in this Classroom Organization Pack. 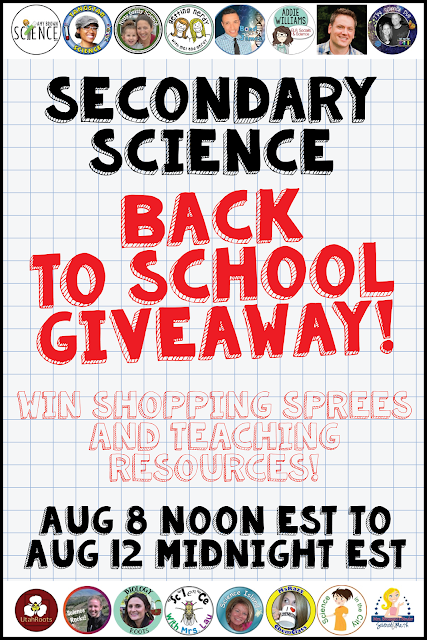 we put together one HUGE blog hop giveaway, just for science teachers teaching grades 6-12 science: Four $100 Teachers Pay Teachers gift cards! For my individual giveaway I am giving two lucky winners $15 in resources from my Teachers Pay Teachers Store. You can enter that at the first rafflecopter below. You have lots of options to enter. For the HUGE blog hop giveaway, each blog post has a secret code word and a number. My clue word is 13. FLOW. The number tells you where the word falls in the secret sentence. Collect the words from each blog, write them down in number order, and copy the secret sentence into joint rafflecopter giveaway. This rafflecopter form is the same on every blog, so you only need to enter once from any one of our blogs! You can enter that at the second rafflecopter giveaway below. I would like to see discussion for hands on activities for genetics! I do have this hands-on lab on genetic engineering, but I know there are many other hands on activities on punnett squares, and I know nitty gritty science, Biology Roots, and Amy Brown Science have some. I would like to see a blog on bringing more inquiry based activities into my lessons. Thanks for the chance to win! That's a great idea for an upcoming blog post. I will definitely add it to my list. I have this product on succession https://www.teacherspayteachers.com/Product/Succession-Storyboard-356654?aref=j8ppj69h but am working on a google product on succession - such an interesting topic. Guess I better finish that up :) Nitty Gritty Science and Getting Nerdy I know have some as well. Anything on running science labs. Science labs make learning science more fun for my 8th grade students! I am looking for all things Next Gen.
That's a good idea...that's the way things are going. I haven't done much that is Next Gen yet. I know Nitty Gritty Science has some NGSS resources, and a few others above. Same here..looking for NGSS especially assessment ideas. I would love to see any information about lab stations for Life Science or Physical Science. I love doing stations. I have some stations, but I have to say, I think Kesler Science is the expert on stations! Inquiry based labs would be great! Inquiry labs are really good for students. Here is a free inquiry based lab from my store https://www.teacherspayteachers.com/Product/Bouyancy-Diving-Ketchup-1157273?aref=o1p3tu8y Its a good place to start with students for designing their experiment. Quick demos are good. Another way I like to do some of these is through video clips. 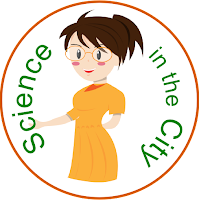 http://www.scienceinthecityclassroom.com/2013/11/the-power-of-videos.html What topic demos are you looking for? The ketchup freebie mentioned above can also be done as a quick demo. I would love to read about classroom management. I haven't written a lot about classroom management. I think a lot can be said for keeping students engaged, having clear expectations and routines, etc. I think that's another good idea to add to my blog post list. The differentiation ideas the next person asked about may help you as well. I would love to read about differentiation for very low performing students. Some of my activities in my store are differentiated, and I know Getting Nerdy with Mel and Gerdy have a lot of differentiated activities as well. I would like ideas on how to incorporate blended learning and project-based activities into biology. Project-based activities is a great idea. Can be difficult to implement, depending upon your students and classroom culture. What type of projects did you have in mind? I would love more ideas for STEM or STEAM. That's a great idea. Not something I have done as much as I would like in my own classroom, but definitely an interest that I would like to write more about. Thanks for the suggestion! I LOVE that you place an emphasis on ALL students. I work at an inner-city school in Memphis, TN -- a place where many students are often left behind. I look forward to looking into more of your biology resources! Thank you. As you probably gathered I work in an inner-city setting too. Before that I worked in special education. That is very important to me. Thanks for the suggestion. That is something I have written a little bit about, and I have some free labs in my store (the static electricity and diving ketchup ones are two of my favorites). But definitely room to write more, especially about stations. I do a lot of stations. Thanks for the blog post suggestion! I'd love to see a post about managing time during labs. Great suggestion! that can be difficult and I have some suggestions! That might be the topic of my next blog post! I'm intrigued by your new google resources! Thanks for joining the giveaway and I hope you have a great school year ahead! I would like some ideas for implementing the workshop model in science. It is an expectation of my district and I find it is not always conducive to the science classroom. I am also trying interactive science notebooks for the first time and am looking for new ideas! Thanks! Workshop model can be a good fit for science. I think that would be a good topic to write about. Thanks for the suggestion. I have written some about interactive notebooks. Here is a post related to interactive science notebooks. I know you have some information, but I would love to see more on implementing digital interactive notebooks. I used paper ones last year, but am moving to a district where I have a classroom set of chromebooks that I would love to utilize. I am glad I found your blog! I love the resources you have on your site - thanks! I would love all of the organizational stuff! I would like to see STEAM activities. Thank you for the comment. This is one of my areas of interest. I started certification for ELL, but didn't complete it. We have a high population of ELL's where I work, as well as a lot that are simply low level readers.